Do You Remember These Vintage Engineering Toys? Think the trend of building toys began with LEGO? Think again! Kids have been building and breaking structures long before LEGO and K’Nex became popular – the golden age of children’s engineering toys actually began in the early twentieth century. Tinker Toys, Lincoln Logs, and Erector Sets all emerged within this time period to achieve mass popularity among kids and families across the country. As many of these companies have faded away over time, new STEM toys for kids have filled their place (including staff favorites like Magna-Tiles, Goldie Blox, and Snap Circuits). To honor the classics this holiday season, we wanted to dive in share more about these early innovative toys. 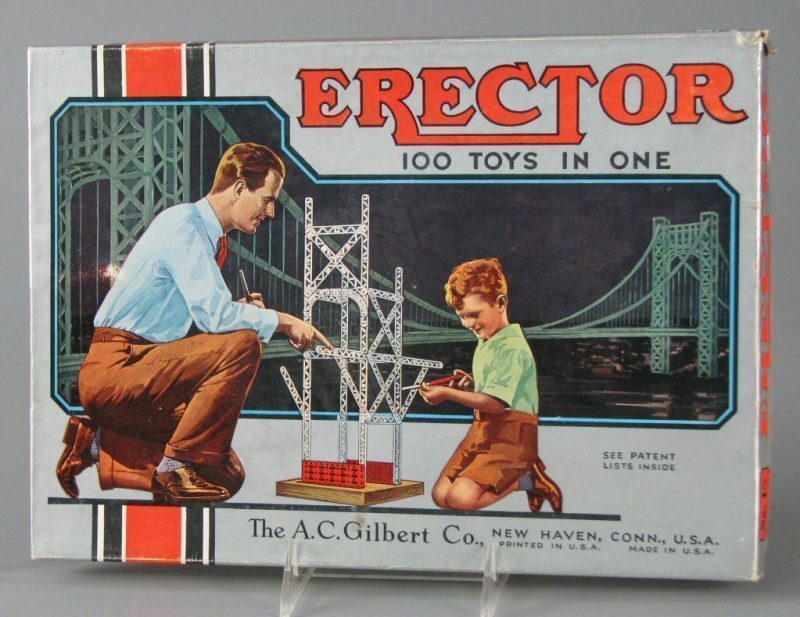 Erector Sets were invented in 1911 by A.C. Gilbert, who was inspired by the process of seeing steel girders used to install power lines. 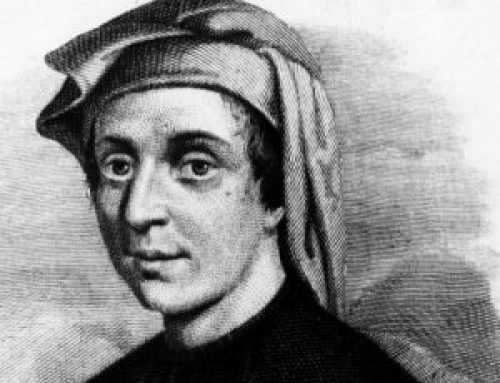 He created simple metal building pieces with square girders that allowed children to construct their own buildings using the different metal parts. 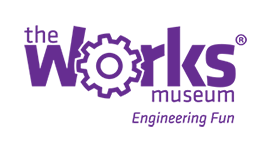 Sales began in 1913 and quickly gained popularity due to the help of a national ad campaign (the first national ad campaign for any toy in the United States). Gilbert designed more complex sets over time but as sales slowed around the 1970’s, the product was discontinued. (via Toy Hall of Fame). A stonemason named Charles Pajeau created the concept for Tinkertoys around 1910 after observing children playing with empty spools of thread, pencils, and sticks. Pajeau called his product the “Thousand Wonder Toy” because of the seemingly infinite number of shapes and designs the pieces could create. 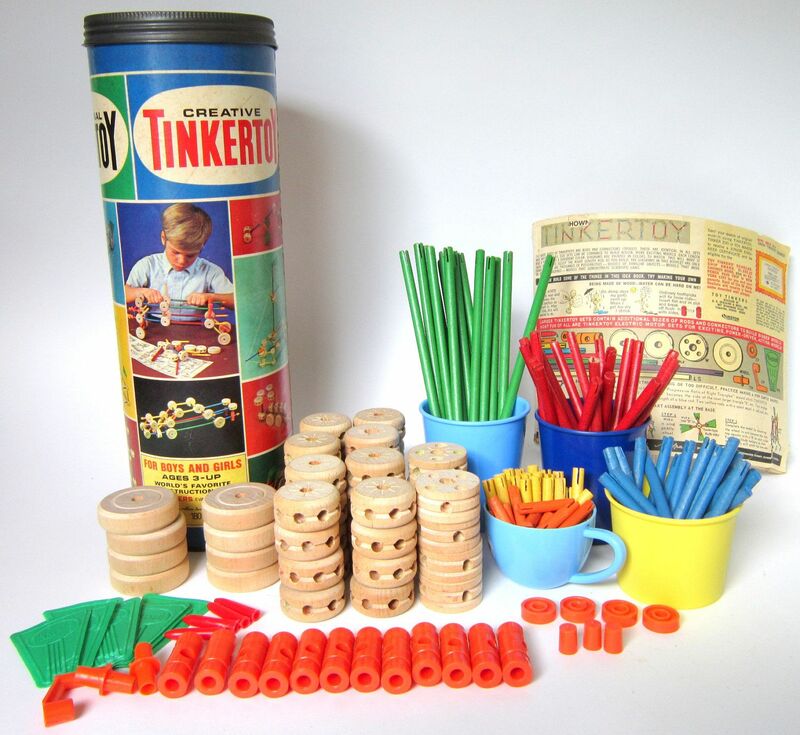 Sales of the product began in 1914, and within the first year of distribution, over a million Tinkertoy sets had been sold. One factor that contributed to the success of Tinkertoys was the strength of the structures children could build. Pajeau designed Tinkertoys based on the Pythagorean Theorem, which gave extra stability to the triangular designs children made with the spools and sticks (via National Museum of Play). The son of famed architect Frank Lloyd Wright, John Lloyd Wright designed Lincoln Logs based on his real plans for the Imperial Hotel in Tokyo. 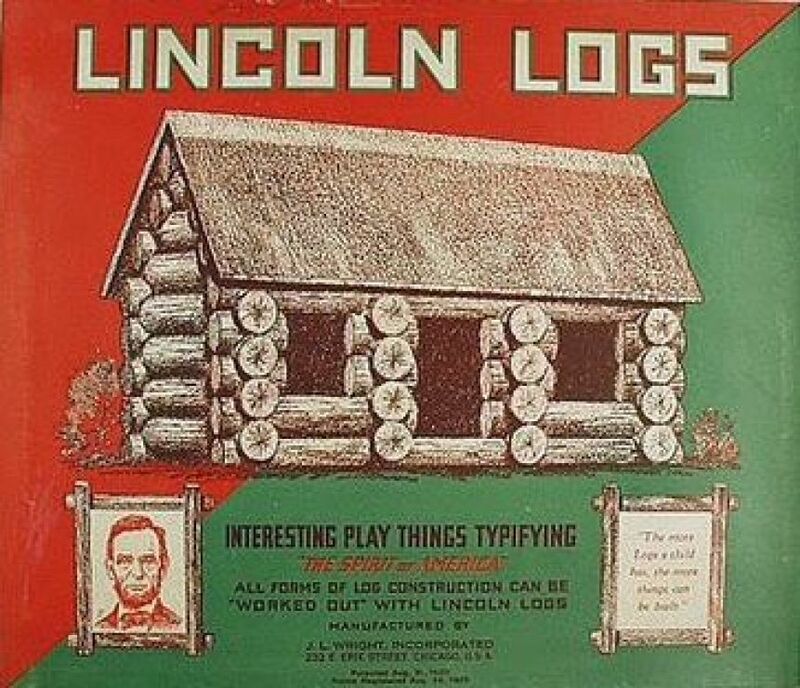 Lincoln Log sets included interlocking pieces made of wood, a design element that would become important when the metal shortage began during the war. These wooden pieces could be used to create cabins representing Abraham Lincoln’s childhood home-among other classic American structures. Lincoln Logs peaked in popularity during the 1950’s as children saw ads for the toy on national television (via History.com). By the 1930’s, an Englishman named Charles Plimpton created his own version of the successful children’s engineering toys he had seen develop over the years. 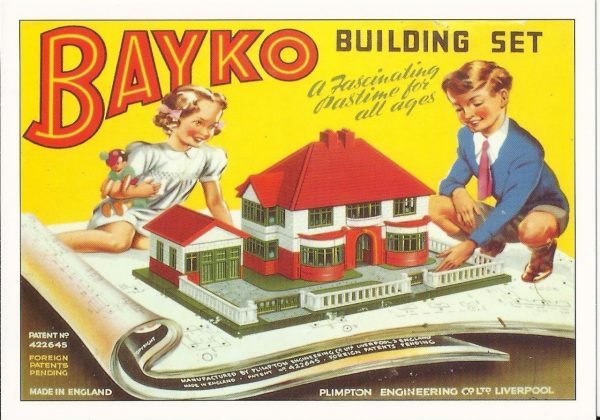 Unlike his predecessors who used metal or wood, Bayko building sets were made out of a type of plastic called “Bakelite.” The Bayko sets were based on a system of baseplates, walls panels, and floor panels that could be connected with vertical beams. Bayko sets offered more detail and decoration than competitors and the company maintained steady sales until the late 1950’s to early 60’s. (Via Brighton Toy and Model Museum). 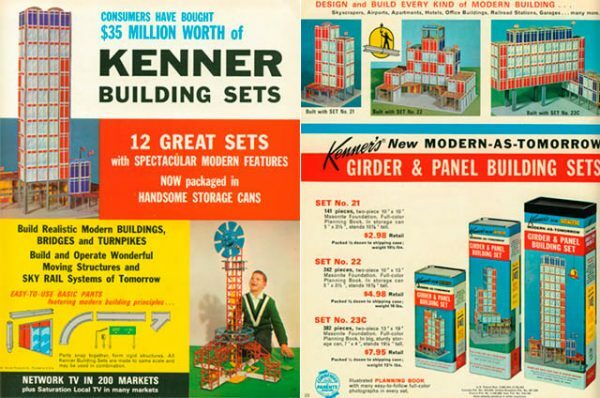 Manufactured by the popular toy company Kenner Products in the late 50’s, Girder and Panel sets were another popular building toy that was designed to mimic real structures. Kenner also created Bridge and Turnpike sets, and Hydro-Dynamic sets that incorporated water, and even some that included battery-operated motor units to create elevators and allow for moving water. These sets were produced late into the 1970’s before declining in popularity. 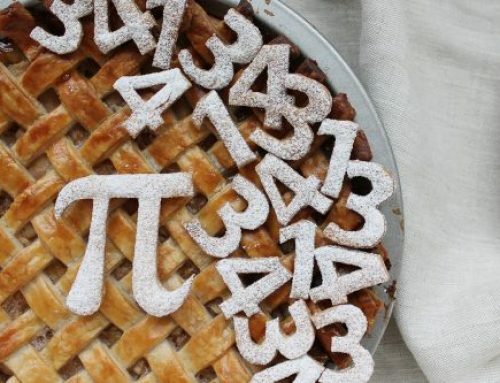 (Via GirderandPanel.net). See the Girder and Panel set come to life in this ad that ran for the Kenner building sets at the time!